Created to celebrate the 25th Anniversary this is a brief, stand-alone tale that has the unique distinction of being in colour. 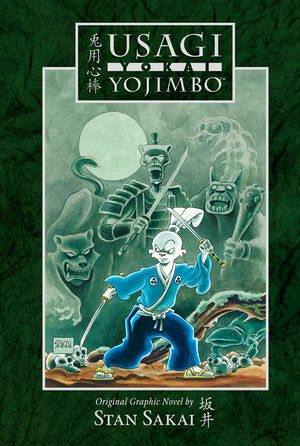 This is a hardback book with some very high production values and features an interview about its creation with Stan Sakai. Usagi works very well in black and white with its line drawings adding an historical authenticity as well as a simple artistic beauty. The thought of a whole volume in colour as anything more than a curiosity might be hard to stomach. But as 25 years of colour covers proves this is not the case and art is wonderful. This book is the same size as the normal volumes but the panels are bigger allowing the colour textures to really shine. It is pencilled and inked as normal and then hand painted with watercolour. Even with a brush Stan is able to pack in a lot of detail and really give depth to the images. The story is simple enough but has the usual (if predictable) twist at the end. It is accessible to the non-Usagi reader although the Yokai (monsters, demons and spirits) of the title appear most bizarre to the Western eye. A Thumbs Up!